Geodata International - Worldwide database of the countries with towns, municipalities, town quarters, postal codes, administrative units and more with WGS84 and UTM coordinates and elevations for geocoding, data processing, proximity search, navigation, distance calculation as Text, CSV, SDF, dBase or SQL files with ANSI, UTF8 or Unicode character set. Databases "Germany" and "Kenya" updated on status 1/1/2019. New country files on the African and Australasian continent. Beginning and end of the Daylight Saving Time added. World time UTC_DIF is determined very precisely from a shape file. New country group "Middle East". The locality database tables of nearly all countries of the world contain towns and municipalities, urban districts and localities as well as postal zip codes with geo references for unique local allocations and distance calculations. Each data record is georeferenced using Lon/Lat and UTM coordinates with WGS84 datum, so the data can easily be displayed on maps and imported into any GIS using standard geographic formats. Additional contents are administrative divisions and statistical units, altitude and Time Zones and presentation of the coordinates in various forms. The data are available across countries with a unitary structure as CSV, SDF and xBase files in UTF8 format so they can easily be used in any standard software and custom applications. Geodata International data files are provided in country-specific accuracy and high topicality and they are subject to continuous quality control. You can connect your own company data with the "Geodata International". This is useful if your company data need to be enriched with georeferences, local or postal features. Thus, for example, addresses can be completed or adjusted even during data collection. Or you want to establish a location relationship for an address characteristic - still a georeference. The georeference can be used e.g. to show a customer the nearest chain store by doing a proximity search. On the basis of the georeferences business zones, statistics or general maps can be made. Towns, municipalities and postal codes can be assigned to the superordinated administrative units. Distances between localities or postal areas can be determined with the coordinates contained in the database tables. For that the georeferences are available in all country database tables as UTM coordinates on the natural and an uniformly meridian strip and as geographical coordinates in degree and deg/min/sec notation. With the elevation data from a Digital Elevation Model the ground level height of each place can be determined. Geographical coordinates in degree notation are particularly suitable well for map views and researches with Google Earth. Here is an Internet URL using the free Google StaticMap-API with the coordinates of the Statue of Liberty National Monoment in New York to show a smal map. The first value behind the identifier "center" is the geographical latitude, then the geographical longitude follows. The shown source below can be inserted directly into an anchor tag to present a map cutout on the screen. All these possibilities are offered by the country database tables, which are briefly described in the following text. 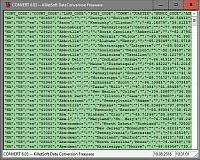 An exact data description and information for the use of the database tables and a lot of test data you can find in the download file. For each country the language variety in ISO 3166-1 ALPHA-2 format and the number of available records are written in parenthesis. Point data of other countries we offer on request. The geodata geodata of the product "Geodata International" are from official sources, they are not part of open-source data! The geodata described here are subject to a continuing quality control. The raw data of the individual countries as basis for "Geodata International" are recorded from there residents authorities, institutions and suppliers. As result the quality of the raw data depends on the infrastructure and the possibilities inside the respective countries. Geodata of the industrial nations exhibit therefore normally a higher quality than those of the developing countries. The geodata are prepared, computed and standardized from these raw data with best knowledge by specialized experts. We have to emphasize expressly that from the raw data resulting deviations or errors of a small extent can not excluded in any case and cannot be faulted. The coordinates are present as geographic coordinates longitude/latitude and as UTM coordinates with UTM easting and UTM northing on the natural meridian strip and on a uniform meridian strip. Because UTM coordinates are converted country-wide to a uniform meridian strip, distances between two points can be calculated by the simple execution of the Pythagoras theorem. That has the advantage in relation to the computation with geographical coordinates (see below) that it is substantially simpler and much faster. The result is the distance between the points in meters. Detailed information and hints to the use of the georeferences can be found in the files of the download or in the detailed Data Sheet. Geographic coordinates are indicated in longitude and latitude. Usually longitude and latitude are represented in the degree/minute/second notation. For further calculations with the coordinates, the minute and second portions must be converted into parts of a degree. The representation of latitude and longitude in degrees is called the decimal notation. For a distance computation the longitude and latitude of the first point (Lon1, Lat1) and the longitude and latitude of the second point (Lon2, Lat2) are needed. If the latitude has a minus sign, the point is on the southern earth hemisphere, otherwise on the northern earth hemisphere. If the longitude has a minus sign, the point is situated west of the Greenwich meridian, otherwise east of it. If the latitude has a minus sign, the point is on the southern earth hemisphere, otherwise on the northern earth hemisphere. degree/minute/second notation (Data fields LON_GEO and LAT_GEO). degree notation are used directly (data fields LON_DEC and LAT_DEC). radians. The unit of the radian is [rad]. that they can be inserted into the formula for the distance computation. The conversion of the geographic and UTM coordinates into state-specific coordinates or in another coordinate and/or Reference System, can be accomplished with the Coordinate Transformation program TRANSDATpro or as purchase order. The database tables are present in the file format CSV (Comma Separated Values). The character set used is UTF8. This format is used often and in most cases you can import data directly into your own data system. 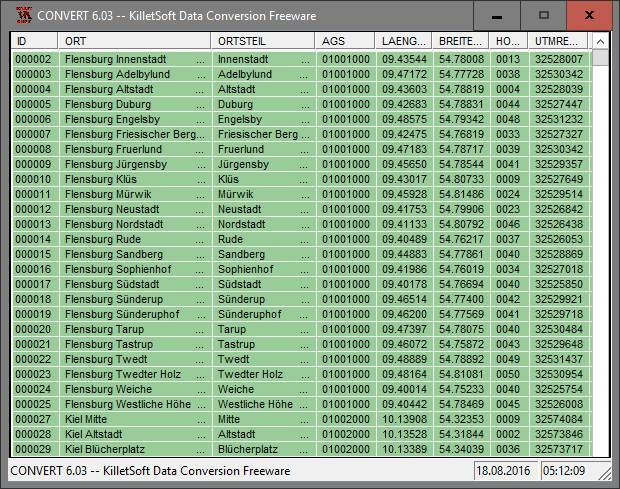 The downloadable freeware program CONVERT converts the available database tables to other data formats and character sets with the necessary sortings and selections. With the program, for example, CSV data can be converted to the SDF format (Simple Document Format) or to the dBase format. For the use of the data on different platforms it is possible to select between the character sets ASCII, ANSI, UTF8 and UniCode. Thus the import of the data in any database management system or file system will be possible. For the import in MySQL or SQL databases the necessary "CREATE TABLE" script can be generated. Further the selection of the data on data fields and data records is possible. In addition the data can be sorted on base of the data fields. 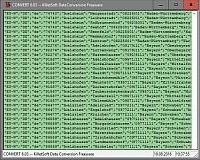 Data from several files can be joined to a common file. 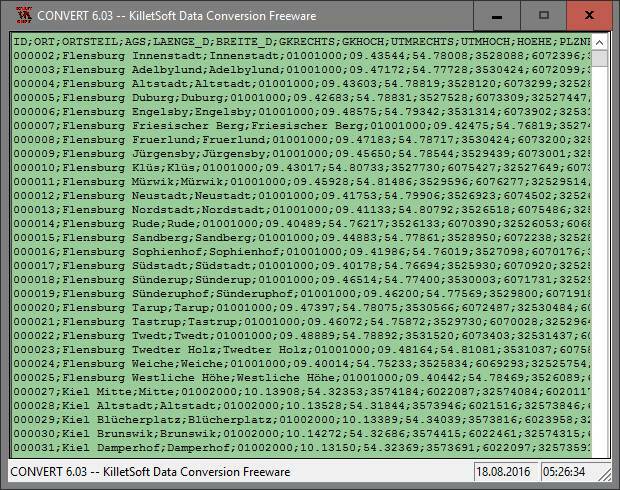 Here you can have a look to some screenshots of the converter program. The license models described here require only a unique payment. No additional payments are raised as a function of the number of installations or on the service life of the license. The service life is unlimited. A single license for a database table entitles the license holder to use the database table with a single software application licensed to the database tables license holder. The software application that comes with the database table can be passed to any number of customers or it can be installed as a single application on the Internet Server of the license holder or the server of the license holder's Internet service provider. A general license for a database table entitles the license holder to use the database table with any number of software applications licensed to the database tables license holder. Software applications that come with the database table can be passed to any number of customers and can be installed on a single or multiple Internet servers of the license holder or license holder's Internet service provider. Pricing and ordering information for the database tables presented here and for other software products can be found in the Price list. Order the "Geodata International" with the electronic Order Form. A selection of test data of all countries with the detailed data description and with information about the use of the data can be downloaded as ZIP packed file by the Internet. 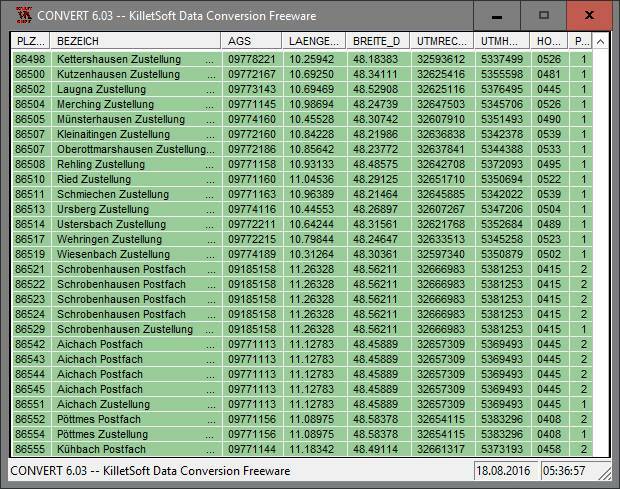 The Freeware program CONVERT, developed by KilletSoft, for converting and adaptation of the data is ready for download if necessary. For unpacking the download files you need an unzip program, which you can download from this side.